In August 2018, NanoRacks was one of 13 companies selected by NASA to study the future of commercial human spaceflight in LEO, including long-range opportunities for the International Space Station. NanoRacks is now pleased to share the expansive industry team that the company will be working with to complete this study and show the viability of commercial habitats (“Outposts”) in LEO and the future of International Space Station commercial utilization. 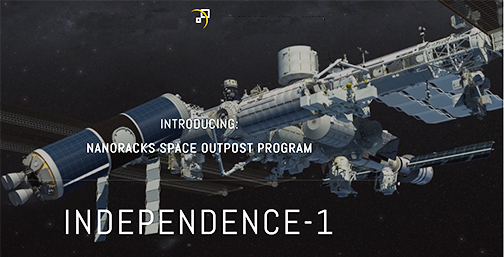 In this four-month study, NanoRacks will investigate the commercial case for the re-purposing of in-space hardware, specifically the upper stages of launch vehicles, via the NanoRacks Space Outpost Program. NanoRacks, and their LEO commercialization team, aim to define the market, policy, and contractual ecosystems required for the commercial sustainability of the Outpost Program — as autonomous and human-habitable platforms. Outpost is not a specific technology but a collection of techniques, including robotic repurposing, outfitting, and payload integrating, for recycling commercially useful volume out of otherwise discarded in-space assets. NanoRacks Commerce Director and Principal Investigator for the LEO Commercialization Study, Adrian Mangiuca,said that this team is unprecedented. Experts from across the aerospace industry are contributing innovative technology and business concepts, all for one collaborative program. NanoRacks CEO Jeffrey Manber noted that this is the company vision coming to life. The company is seeking to dramatically lower the cost for operating multiple commercial Outposts throughout the solar system, and the firm plans to do so in a way that leverages the expertise of agile commercial space companies, and feeds back into the growing ecosystem. NanoRacks is looking at the role of government in the evolution of the International Space Station in the roadmap to commercialization.